How is a European identity significant to the future of the European Union? The uniting effect of a shared European Identity is of paramount importance when considering the multi-ethnic makeup of the European soil and the increasingly fractious nature of its politics. 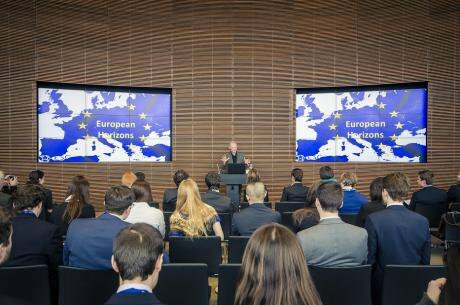 The arguments and policy visions presented in this article have been collaboratively generated by the participants of the Identity Workshop at Yale University’s European Student Conference: “The Future of the European Union” held in February 2015. The purpose of this workshop was to engage in a discussion on the concept of a shared European Identity: What is a European Identity? How, if at all, is it significant to the future of the European Union, and what can be done to promote its development? My objective in what follows is to introduce and summarize the participants’ policy visions regarding the construction of a European Identity and invite further inquiry into the content and meaning of this often overlooked yet vital dimension of the European integration. The workshop reached a general consensus that a European Identity is critical to the legitimacy and effectiveness of EU political institutions and proposed several policy measures oriented towards strengthening said identity. The policies proposed by the participants range from raising awareness of the significance of a European Identity to closing the gap between EU and its citizens, facilitating economic solidarity amongst EU states and increasing the role of EU in judicial policy, minority rights and border policing. A European identity is a fluid and multilayered form of belonging that does not necessarily clash or call for a realignment of one’s sense of loyalties or identification with a particular nation; it is rather an identity that compliments, enhances and enriches one’s own national identity. What is the role and significance of a European Identity? Understood within this capacity, a shared European Identity plays a vital role in facilitating policy implementation at the European level and in increasing the effectiveness and legitimacy of European political institutions. The higher levels of integration amongst European states, which have expanded beyond the initial economic dimension into the political and social sphere of activity, serve as a dual reminder of the benefits and potential pitfalls of European interconnectedness. In times of economic prosperity and stable international relations, all EU member states are better off cooperating and harvesting the political, economic and cultural benefits of EU membership. In times of economic and political adversity however, this balance is consequentially threatened. Crisis of a financial nature resulting from economic instability, market fluctuations or trade marginalization, all of which are present in the contemporary age of globalization, may have devastating effects on the individual economic and political dynamics of its member states and threaten EU’s stability. In this context, a European Identity would serve as a uniting force capable of promoting cooperation amongst member states and facilitating the implementation of EU level policies. This would be the case even when policy initiatives aimed at producing long-term benefits for all member states, may in the short term pose political and economic disadvantages to particular members. A European identity, as such, would protect against voter backlash in response to economic initiatives by Germany to benefit the struggling economies of Greece, Spain, Italy or Portugal. In doing so, it would enable the implementation of such policies and support a European citizenship and political community that could facilitate European-level political, economic and social interventions. It is therefore under these conditions that the legitimacy and robustness of the European Union would continue to thrive. The uniting effect of a shared European Identity is of paramount importance when considering the multi-ethnic nature of the European soil. Movements for autonomy and statehood that have reverberated and prevailed throughout Europe with the collapse of communism in the 1990s were the catalyst for the rapid transition of the post-communist bloc from 9 countries in 1989 to 27 within a short period of four years. Kosovo’s independence in 2008, as well as Scotland’s and Catalonia’s independence movements further indicate this ongoing dynamic. While upholding their national roots and claiming independence on the grounds of ethnicity and nationality, these movements simultaneously share an underlying recognition that their independence could only function in the context of the European Union. The challenge therefore is to structure the rising and potentially problematic secessionist and nationalist European currents in a way that capitalizes on national-level incentives of “dual” belonging in efforts to promote the EU objective of strengthening the economic, political and social integration of the European states. The need for a common European Identity rises precisely due to the social and ethnic diversity of the EU member states. While history suggests that the multi-national anatomy of federal states like US, Canada, India etc. has impeded the democratic success or economic growth of these states, it must be recognized that such developments were facilitated to a great extent by the coexistence of shared American, Canadian or Indian identities with individual state loyalties and closely identified ethnic or caste identities. It is this coexistence of identities that continues to influence patterns of political and economic development by promoting the synergy amongst the individual states. A European Identity would serve a similar uniting role in the European context and its development is needed to support and establish a vital and functioning European political community. Despite its significance however, the establishment of a European Identity faces key challenges. Eurobarometer data indicate that among EU citizens, sentiments of “feeling European” rank third to sentiments of belonging to a nation (94%) and a region (91%). Furthermore, even when a European Identity has emerged, its distribution is not uniform. Thus, while states like Finland, Germany, Sweden and Slovakia, amongst others, embrace and celebrate their European identity, other EU members like Latvia and Romania lag behind in their “European” identification. These challenges notwithstanding however, there is room for optimism: Scholarly works find that a “civic” European identity understood as belonging to the European Union as a political system has begun to prevail over a “cultural” identity in several EU states. The challenge to be addressed therefore is the identification of policies that would cultivate and foster a European Identity with the greater objective of facilitating the social and cultural integration of European citizens, increasing cooperation between EU member states and ultimately promoting the European project. The first measure towards the development and advancement of a European Identity is raising awareness of the importance of such an identity. To this end, the European Union should endeavor to organize symposia dedicated to promoting discourse and professional collaboration amongst European artists, journalists, writers and other leaders of thought. This collegial environment would serve as a medium for exchanging thoughts, sharing ideas and recognizing the greater personal and professional advantages of an integrated and united Europe. Moreover, the European Union should establish interdisciplinary programs of a similar design aimed at increasing the cooperation of young, highly talented people from all over Europe who have the potential of becoming tomorrow’s leaders in their fields of disciplinary interests. Named “Summer Retreats for Young European Leaders,” this program could be modeled after the “Sommerakademien” run by Germany’s Studienstiftung des deutschen Volkes with the purpose of increasing intra-European professional and cultural integration and granting young leaders the opportunity of recognizing first-hand the multiple dimensions and advantages of a European Identity. Pressing the point of education even further, it is equally important that policy measures aimed at promoting a European Identity reach the younger citizens of EU member states. While educational measures remain under the authority of the individual national-states, EU must incentivize member states to promote the continuous in-school introduction to the culture, history and languages of various European states. This can be realized via textbooks that also underscore the importance of a European Identity. Thus, allowing citizens of a particular state to appreciate the uniqueness of culturally different “others” while simultaneously advancing the social and cultural integration of European citizens. These policies should be introduced at all educational levels and must be adopted by all EU member states. An additional measure aimed at promoting a European Identity and maintaining the cohesion of the European Union is the establishment of shared institutions and practices that would address the evident disconnect between EU’s institutions and its citizens. According to Eurobarometer data, only 39% of citizens perceive the EU as “conjuring a positive image” although the degree of identifying with Europe appears to increase as citizens’ intra-European interactions also increase (2014). Furthermore, 41% of respondents agree that institutions and programs that promote social welfare would strengthen their ability to identify with Europe and feel European (Eurobarometer, 2013). Recognizing such patterns, several initiatives can be undertaken to strengthen a European Identity, close the gap between EU and its citizens and expand the role of EU from a mere regulatory, restrictive body to one that relates to its citizens at the micro level via the establishment of institutions and programs that directly influence and improve their well-being. In addition to youth camps (proposed above), academic seminars organized at both pre- and post- university levels would also foster an atmosphere of collaboration and unity amongst Europe’s young leaders. Allowing the scope of the Erasmus program to expand beyond the academic population to pre-university and vocational training students, would further promote the social and cultural integration of Europe’s future generations and in the process strengthen a European Identity needed for the robustness of the EU itself. The role of media and the internet as crucially influential institutions must also be utilized to promote the European project: Both the media and new ways of unmediated represent a fundamental means to promote and share ideas about political and social principles about the EU. Currently, a majority of the national media remains engaged in EU affairs but leans towards an anti-integration stance. To address this, we suggest the development of a European Union media adapted at the national level by all member states, the agenda and funding of which is under the authority of the European Union. The influence of this type of media would raise citizens’ awareness of EU affairs and narrow the institutional distance between EU and its citizens by not only increasing citizens’ awareness, but also promoting their participation in EU elections, affairs and practices. Moreover, addressing the existing economic disparity within the European Union would contribute to the reinforcement of a European Identity and the legitimacy of the European Union. The current European crisis has increased the financial disparities between the economically dynamic northern Europe such as Bismarckian Germany and Scandinavia and the “Mediterranean welfare states” of Cyprus, Greece, Italy, Malta, Spain and Portugal. Such disparities, the impacts of which can be observed along the dimensions of economic growth, labor market flexibility, employment and innovation have had considerable negative repercussions on the younger citizens of Europe and have further highlighted generational employment differences within the EU. Thus, in year 2012 alone, 25% of EU citizens under the age of 25 remained unemployed while only 10% of the citizens 25-74 years of age experienced similar unemployment difficulties. EU-initiated policies such as the Youth Employment Initiative have indeed been established to address this very concern, however, more remains to be done. Fostering a European Identity established on a democratic model of shared benefits and ‘communitarizing’ of a certain amount of losses through a fiscal union and control of domestic expenditures has the potential of alleviating economic pressures by reinforcing fiscal responsibility and economic solidarity within the EU. Policies aimed at higher taxing of private wealth and firm stances towards fiscal fraud are an additional effective measure to this end. Generating a stronger tax base can contribute to the objective of economic solidarity within the EU: this can be achieved by reforming of the educational systems and expanding vocational training in efforts to meet the needs of the production system and foster the innovative capacity of the Social Market Economy. Reforming the labor market can also increase the economic solidarity of the EU member states and ultimately foster a European Identity: initiating programs that incentivize member states to move beyond passive social expenditures and invest in active labor market policies, “flexisecurity”, employment training, high quality educational programs and child care policies can contribute to economic competitiveness within the EU labor market, reinforce economic solidarity amongst EU member states and ultimately establish a platform on which a shared sense of European Identity understood via the lens of Social Market Economy can be effectively established and fostered. Finally, given the multi-ethnic character of Europe, the establishment of a shared European Identity necessarily calls for policy and cultural accommodation of intra-European immigration and migration from third party states. The expectation is that these policies would promote ethnic acceptance and multi-cultural integration within Europe and encourage the mobility of European workers. In an atmosphere of an open European labor market characterized by non-discriminatory social and cultural conditions, the ability of European citizens and low-skill migrants to move freely within the European labor borders increases significantly, and so does the potential to expand one’s sense of self and identity to align with those of the larger European borders. Increasing the salience of human rights in the European political, economic and social context is contingent upon the role of the media in increasing awareness on this significant matter and an active engagement of the EU in matters of minority rights, judicial policy, border controls and the supervision of arms trading. In his seminal 1882 piece “Qu’est-ce qu’une nation,” Ernest Renan prognosticated the end of European nations and the advent of a European confederation. It is not clear whether Renan’s predictions will soon be fulfilled despite European integration measures such as the Treaty on European Union in 1993, that of Amsterdam in 1999, Nice 2003 and Lisbon 2010 - all of which aimed to promote a European political community. What is increasingly clear however, is the fact that at the foundation of a long-term and viable European community must rest a shared, fluid and multilayered European identity that will promote the political, economic and cultural integration of EU member states and citizens, facilitate policy implementation at the European level and ultimately safeguard the longevity and legitimacy of the European Union. We have suggested above several policy measures that would advance the development of such an identity. As often is the case however, issues of identity are complex and multidimensional phenomena that invite equally complex and rich debates. Let the discussion and policy visions presented here constitute an invitation to an open debate on the vital issue of a common European Identity. Castells, Manuel. 2002. “The Construction of European Identity,” statement prepared for the European Presidency of the European Union. [http://chet.org.za/files/CASTELLS%202004%20European%20Identity.pdf, last visited on February, 4th 2015. Brutter, Michael. 2005. “Citizens of Europe? The Emergence of a Mass European Identity.” New York: Palgrave. Qu’est-ce qu’une nation, trans Ida Mae Snyder (Calmann-Levy: Paris, 1882), 26-9.